Overlooked by the NFL, DeVante Kincade will start his pro career playing arena ball. One of the best HBCU quarterbacks of this era is ready to start his pro career. 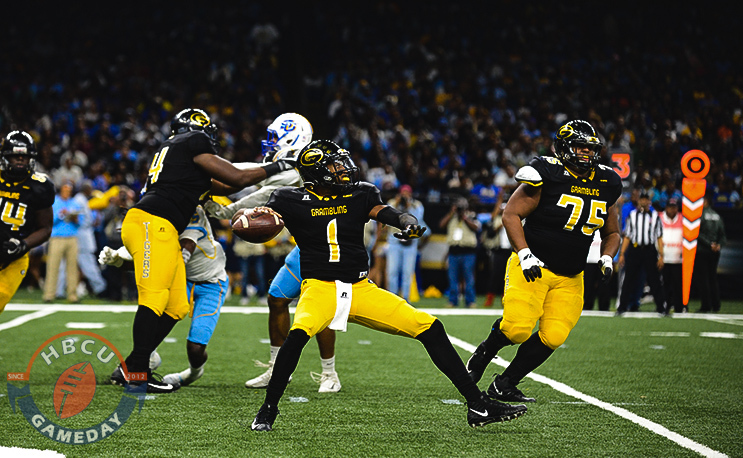 Former Grambling star DeVante Kincade told HBCU Gameday that has signed with the Maine Mammouths of the National Arena League. The 211 alludes to Kincade’s weight, which he put on in preparation for the NFL Draft. Some mock drafts had Kincade going late in the selection process, while most figured he’d at least get a tryout or a UDFA deal after a solid workout with the Dallas Cowboys. Neither happened and instead, Kincade will take his talents north as he realizes his dream of becoming a pro athlete. Grambling quarterback Devante Kincade hoping to do more winning in 2017. DeVante Kincade eludes an Alcorn State defender in the 2016 SWAC title game. DeVante Kincade celebrates a TD pass at the 2017 State Fair Classic. DeVante Kincade throws a pass at the 2017 Bayou Classic. Kincade set the HBCU football world on fire in 2016 when he transferred to Grambling after starting his career in the SEC at Ole Miss. He led GSU to a 22-2 record in two seasons, throwing for just under 6,000 yards and 54 touchdowns to just eight interceptions in 537 pass attempts. Grambling won SWAC titles in both seasons with Kincade at the helm and claimed the HBCU National Title in 2016. Grambling never lost to a SWAC team with Kincade at the helm. He’s joining a fledgling franchise in its first season in the NAL, one that is just 1-4 after its first five games. The Dallas, TX native is the latest in a long line of former HBCU signal-callers who have found a home playing arena football after leaving the Yard. Former Howard star Greg McGhee, the MEAC’s all-time leader in offensive yardage, made his first start with the Philadelphia Soul last week. Current HBCU coaches like Alcorn State’s Fred McNair and Alabama A&M’s Connell Maynor all played arena ball after their college careers.